I discovered this uber elegant department store whilst in Germany last month. The sunny yellow window story celebrating spring fashion / Manhattan meets Munich first caught my eye (actually it was the beautiful building with black silhouettes in the first floor windows that first captured my curiosity). I wasn't disappointed when I stepped inside for a snoop. It is always "interesting" to see what sits on the top floor of a department store. Increasingly such spaces are being converted to "dining with a view" (if a view is on offer) or speciality destinations. To my surprise I found a seriously luxe fit out and a very large CD collection. My first thought was "wow this fit out must have cost a bomb ... it's gorgeous ... and their customer base must be 60 yrs plus". I wondered why such a department even existed with on-line sales seemingly decimating the music category. I discovered the store specialises in a certain category and "very hard to find" discs. Offering the largest classical music collection in Europe this is a well known destination for lovers of Baritone, Baroque, Busoni and a zillion other classical composers with names that left me clueless. I love a retail surprise and Munich was full of them! BFF (the Californian one) has assured me that I, and my POD bods, would love the new experiential store at the Culinary Institute of America. If you're heading to the West coast then I'd be popping in for an eye-spy. CIA, St Helena, Napa Valley, CA. Living at the other end of the Earth is no fun if you love to keep an eye-spy on what's happening in retail in Europe and the USA. Eighteen months ago I decided to ignore the tyranny of distance and make sure I spent more time OS looking at merchandising and emerging trends. I have just returned from my 3rd trip to London in just over 12 months. It's a fabulous city with brilliant retail benchmarks for fashion, food and lots of things in between. The windows at White Stuff have caught my eye on every visit ... ranging from squirrel heads on mannequins to celebrate autumn, to 'village fete' tea type sets ... each time I have loved their kooky approach. 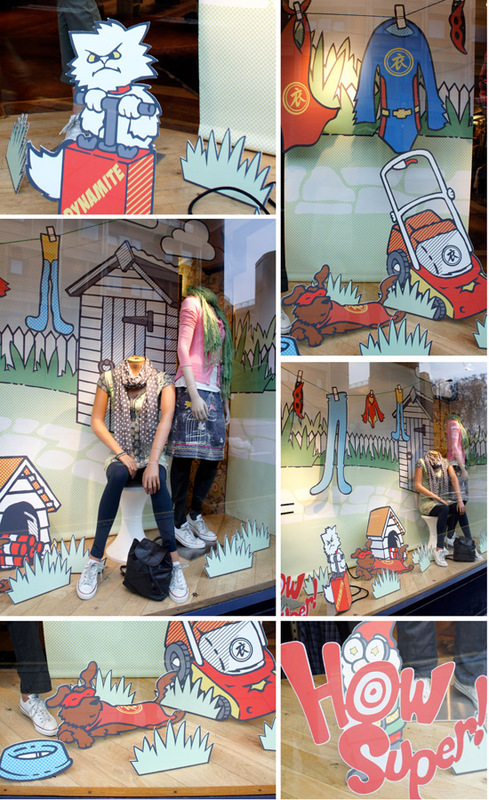 Last week I spotted their super hero cartoon character windows ... too much fun. White Stuff started out as a ski apparel brand ... over the past 25 years they have gone mainstream whilst retaining an indie feel through store design and careful location selection, and from what I can gather continue to post fab sales growth figures. They were onto retro wall papers and props seemingly before everyone else in retail land and their casual, easy to wear, clothing is presented as colour stories. Their VM makes me smile, if not laugh out loud. The 25 year Silver Jubilee theme was a right royal corker ... or should I say a corg-er! Coronation chicken sandwich anyone? Smokey BBQ pork belly served with an 'orchard' salad sounded good to me ... when I quizzed my waiter if I should pick this dish, or if there was another the restaurant was well known for, his reply was "you know the pork belly reminds me of Sundays". My immediate thought, on what was a rather grey and quite nippy London day, was ... ooh that sounds comfy, familiar, family and friendly ... and SOLD! The delightful Richie Davis was my boy wonder waiter at Barbecoa (blurry pic on the right), Jamie Oliver's new restaurant tucked in behind St Paul's Cathedral in The City. Whilst I tried my darndest to snap a pic of the super friendly and knowledgeable Davis he was too fast on his feet to get a clear papparazzi shot (in other words, I failed dismally). Sporting robata grills, a tandoor oven, fire pits and a Texan smoker ... if you can't stand the heat in the kitchen then I recommend you pull up a chair in the Tom Dixon designed interior and enjoy a fab view of Sr Christopher Wren's architectural wonder. Barbecoa was packed to the char grill with city suits on a Tuesday lunch time ... a fair indication that if there is a recession in the UK then it is apparently being ignored with fabulous abandon. Overall a rather stunning fit out and flamin' good menu, particularly if you're a meat eater. If you're popping into St Paul's to say one then I would be praying this is on your lunch agenda. P.S. As a side note, when the POD is out pounding the pavements of various cities around the globe looking for retail inspiration sometimes she gets a little foot weary but this was definitely worth the walk to get there. Barbecoa is a joint venture by Jamie Oliver and Adam Perry Lang. The web site tells the story in a lot more detail. I am drifting a little from the regular POD fodder subject, but this one was too good not to share. I arrived in Munich to find the town in full-on Fat Tuesday mode. Young and old get dressed up and celebrate the last day before Lent (the 6 weeks before Easter). The dudes in the orange Combi win the smart award (bring your own seat), the Viking was literally standing up having a bit of a kip but my fave has to be the buxom blonde!. From what I could see they give the beer halls a fair nudge on this particular day ... those Germans sure know how to party! 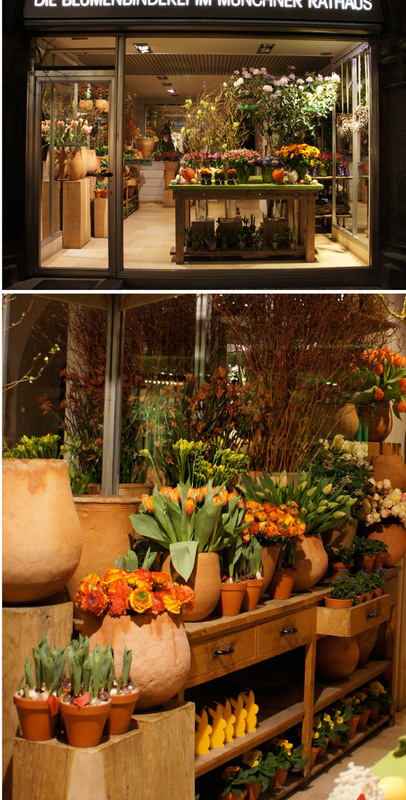 I wish I hadn't spotted this florist when it was closed as I would love to have snapped some more pics. Spied somewhere in downtown Munich. 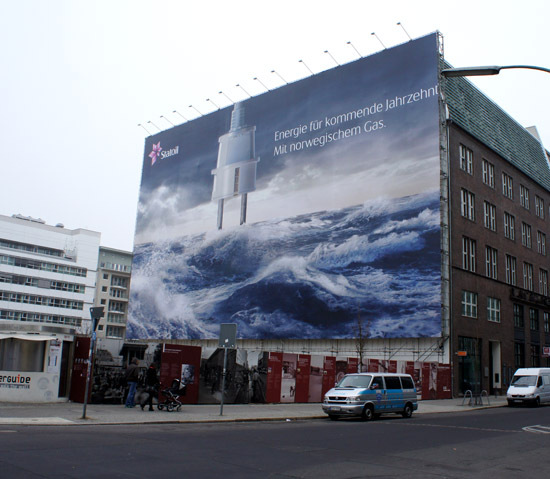 Lordy they love a big billboard in Berlin. 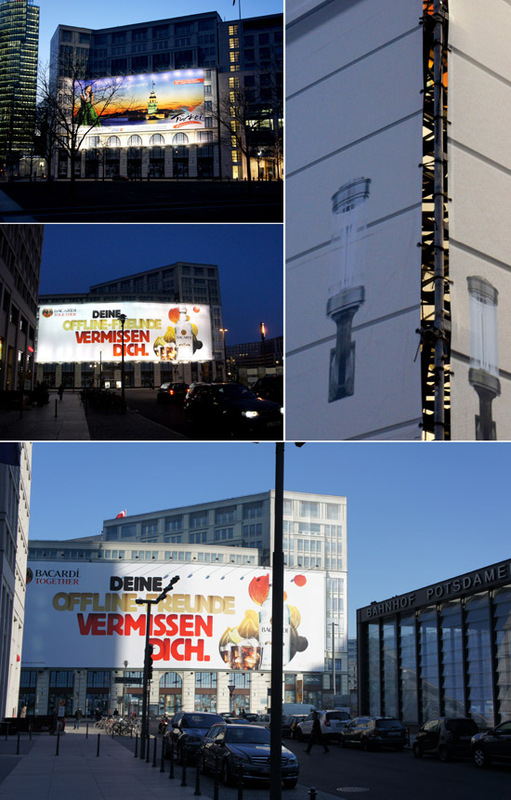 You have to go to Checkpoint Charlie to check this out. Simple yet striking windows showcase neutral spring fashion tones. Spotted in Munich. 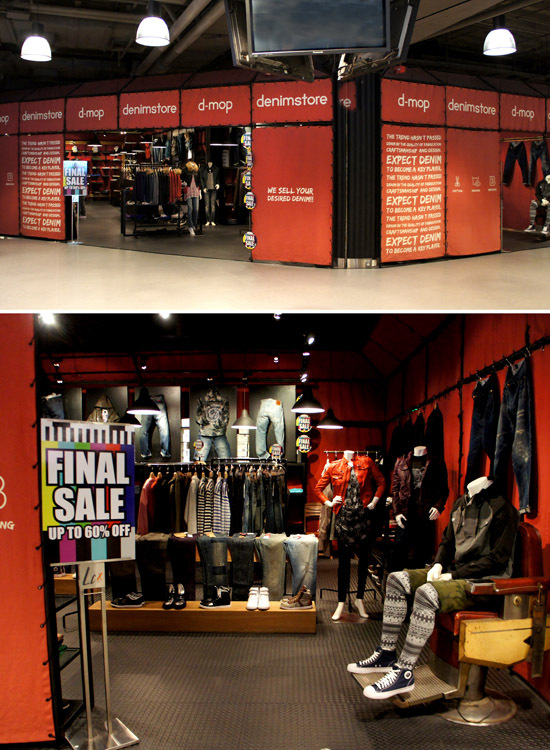 D-Mop has set up camp in Ocean Terminal with a fully enclosed canvas cave of denim cool. I gather this is a permanent shop that sits within a cluster of youth fashion brands. Would shopping centre developers in Oz allow such a nimble approach to store finishes and design? I doubt it ... but as the world changes around us all I guess we have to start thinking of new ways to jump the barriers regarding cost of entry to play in the mall, keeping indie brands in the mix ... and customers coming back for more. Spotted in Hong Kong.